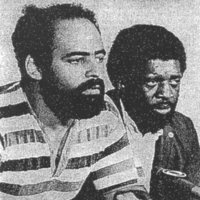 This is a 1968 photo of Bronx CORE chairman Sol Herbert (front, stripped shirt) and Brooklyn CORE chairman Sonny Carson (back). Both men led their chapters to secede from CORE over the election of Roy Innis as national director. Before becoming chairman of Bronx CORE during Floyd McKissick's tenure as national director, Herbert served as second national vice president under James Farmer. “photo of Bronx CORE chairman Sol Herbert and Brooklyn CORE chairman Sonny Carson ,” corenyc.org, accessed April 21, 2019, http://www.corenyc.org/omeka/items/show/104.